In October of 2010, the Ruckelshaus Institute hosted a conference in Laramie titled "Bark Beetle Impacts in the Intermountain West: Redefining Post-Disturbance Forests and Managment Strategies." The workshop invited forest managers, scientists, and stakeholders to evaluate the current status of forests impacted by bark beetle and to discuss management approaches and policy implications. 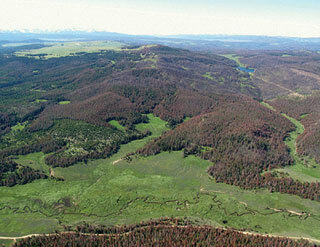 The current bark beetle outbreak involves multiple species of bark beetles and tree hosts, and is impacting millions of acres of forests in the Intermountain West. This epidemic is also creating forest conditions that are unprecedented, and likely outside the forestry experience of many resource managers and scientists. It is currently unclear if existing management approaches will be appropriate and/or effective in post-disturbance forests to create desired forest conditions in the future. In fact, identification of future forest conditions remains a challenge. This workshop will bring together forest stakeholders and managers to begin to identify high-priority management areas, topics, and strategies that can help shape forest management policies that are sustainable.